My pet hamster, Cotton, loves it! 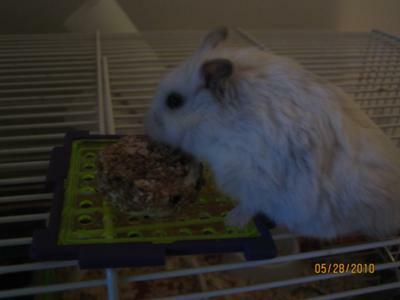 My pet is a dwarf hamster named Cotton and she loves to eat cereal, bananas, pecan halves, and hamster drops you can buy at the store. So I made up a recipe for her. 1. Get a bowl you don't need - but that's still squeaky clean because you don't want your hammy to get sick. And make sure your hands are clean. 2. Put all the dry foods in the bowl and crush them (or use a blender if you have one). It doesnt have to be perfectly crushed but do the best you can. 3. Put the drops into the bowl and melt them either using the microwave or some other way, but I recommend the microwave. 4. Mix them all together. 5. Now it should be like powder. Then cut a piece from the middle of the banana about 1 cm (1/2 inch) high. 6. Scrape a hole in the middle of the piece of banana and stuff a bit of banana mix with the crushed cereal and drop powdery mixture. 7. Rub the piece of banana in the remaining bit of cereal and drops. but not the bottom part because then the banana part won't stand properly. 8. Crush the pecan half and put a few crumbs on the top! Pretty cool, eh?? And remember to cut it into a few pieces because your hammy can’t finish the whole thing. In the picture Cotton is eating the whole thing but it just looks better like that and I took it away from her after she ate a bit of it. you don't need to do anything too complicated and it doesn't contain stuff like peanut butter or stuff that might clog their pouches like other peoples recipes.